News, updates and excerpts from publications by the boutique Australian comic publisher Second Shore. Welcome to Word Balloons, an Australian-based fanzine on comics that will deal with the medium in this country, but with an international perspective. It is largely the work of one person, myself, and is intended to reflect my interests in the medium. Whilst I do print the work of others my primary position is self-generated work. Despite a long history in the medium as reader, retailer, occasional writer, and editor ‘fanzine publisher’ was not a title I was expecting to add to the CV. At the end of the 1980s my contact with the medium decreased when Fox Comics ceased publication and I left Minotaur. For much of the 1990s I had only a limited interest in comics. Around the turn of the century, I found my interest growing again, but this time with a some-what different angle. With the perspective of middle age, to say nothing of a history degree, I have become sharply aware of the need to preserve aspects of the past to hopefully inform those in the present and the future. To my mind, fandom in this country has never been particularly good at this, leading to a lot of reinvention of the wheel occurring, especially when it comes to creating and publishing comics. During the early years of the century I conducted interviews with a couple of locally-based creators active on the international stage (Bruce Mutard and Colin Wilson). Then, started yo write up my recollections of my involvement with the medium. There were a number of reasons for doing this. Firstly, I wanted to document the patterns of comic collecting in the 1960s and 1970s, a process that has been irrevocably changed by the arrival of comic stores. Secondly, I wished to chronicle the beginnings of comic fandom in Melbourne. Lastly, I thought it would be worthwhile recording my reflections on the establishment and running of two comic mags and a shop. However, when I began looking for likely repositories for these works I found that even with the internet suitable locations were not plentiful. So I decided to publish them myself. Now I know in these days of electronic communication print-based media can seem megalithic by comparison. You may ask why a fanzine, not a website or blog where the works would undoubtedly reach more people. Essentially, two reasons. Firstly, for all its immediacy electronic publishing is still less permanent. Huge databases can disappear in a blink of the eye and given that few people probably bother to save, let alone print information from web sites a small-run magazine may still end up in more peoples’ hands. Secondly, having grown up with print-based fanzines it is my medium of choice. What I am basically resurrecting is the ‘personal-zine’ i.e. a vehicle for one person’s likes and opinions which has been largely superseded these days by blogging. As for the title, well it is a bit cheesy but it does tell you the mag is about comics without needing to put it in the title. It also has a bit of a history as in the mid-1970s, one Gary Groth published a single issue of a fanzine on the same name a few years before taking control of the Nostalgia Journal and renaming it the Comics Journal. 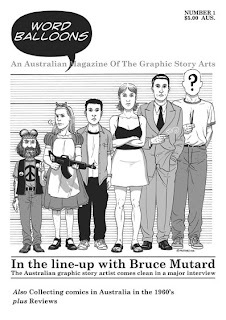 An interview with Bruce Mutard. PB: A lot of your early work had quite a strong socio-political agenda, often with a vigorous polemical angle. Would you say you have a social conscience? PB: Your presence in your work at this time also seems fairly in-your-face. Would you describe yourself then, or now, as an ‘angry young man’? BM: Back then, yes: a lot of angst not thought through or well directed. I guess I was looking for a sort of ‘angry humour’. PB: Not so satirical though. A lot of underground artists worked with satire, but with you the polemic tended to cut across this. BM: I was aspiring to satire, but it’s a difficult art to master. Also, the restrictions of only having a few pages to work with didn’t help. PB: The enduring aspect of your work from this time, that has carried through into your work today, is the inner dialogue; whether externalised in a conversation between two people, or as an inner debate with oneself. Was that a planned approach? BM: It was more organic. I took the line that the message was important, but I could see both sides of it. To use multiple voices was an easier form of storytelling. I have learnt to take a more considered approach to my socio-political work. That’s where you get the lengthier narratives which now predominate, where I am trying to develop a theme through drama. PB: You still use the externalised inner dialogue, but in a more refined sense: Robert Wells and his various friends and relations in The Sacrifice [Allen & Unwin, 2008], Sir John and Abdul in “The Holy Kingdom” [SPX 2004]. But now it’s less of a slap in the face. BM: I felt that the overly polemical work could put people off. I guess my move away from it was a part of the maturation process. I don’t like to be yelled at and I realised I was yelling at people too. PB: The refinement works particularly well in “The Holy Kingdom” [a twelve page strip set in the Holy Land during the Third Crusade at the end of the twelfth century]. It is a political work, but its message is delivered with some subtlety. BM: I didn’t want to do a polemic because it was going to appear in a themed volume which undoubtedly was going to feature other polemics. [At this time, each issue of SPX had a theme and the one for 2004 was war.] And the whole issue itself: war in general, and the War on Terror in particular, are highly polemicised subjects at the moment. I certainly have firm opinions on them but to engage the reader I wanted another perspective. I felt that drama threaded with the points I wanted to make would be more effective. Setting the work in the past was both to help identify the general themes, but also because the protagonists on both sides of the War on Terror refer back to the Crusades as a motivating factor. I believe that there is quite a strong religious thread to this current war, although it isn’t that explicit. But I had been tossing around the idea of doing a story set during the Crusades for a long time. I’m interested in exploring the institutional abuse of faith using that theatre of war as a background. The original plan was for it to be a graphic novel. PB: What are you working on next? To read the rest of the interview covering Bruce’s self-published Street Smells, his upcoming graphic novel on the intersection of art and spirtuality The Silence and lots more besides purchase Word Balloons 1. Although, in one sense, the 1960s don’t seem that long ago to me they were, after all, forty years ago. Long enough for memories to start to fade and a new generation to arise who may well be largely unaware of how it was to a comic aficionado at a time before comics shops, deluxe formats, and organised fandom. So because I have a predilection for such things I have decided to set down my own recollections. They are part personal memoir, part detailed exposition on the mechanics of comic collecting at this time which may bore the pants off some. If this is the case, then succeeding parts which will take the story into the 1970s and 80s, and detail the beginnings of comic fandom in the city, may be of more interest. These will be followed by dissertations on my involvement in the establishment of Melbourne’s pop culture Mecca, Minotaur, and the Australian comics Inkspots and Fox Comics. All this is obviously my recollections alone and makes no claims to be the authoritative view. Others may have seen things differently. It would be interesting to see more recollections, especially from those in other states. You can blame it on the measles. When I contracted them, aged four, my kindly next door neighbour gave me some comics to aid the convalescence. The rest, as they say, is history. These were not comics in the true sense, but English children’s magazines (Jack and Jill and Playhour) that contained stories and puzzles as well as some strips with text beneath the panels, rather than word balloons. Over the next few years I discovered American comics both in original editions and local reprints. I first gravitated to local reprints of Walt Disney strips, then a year later discovered superheroes through local B&W reprints of the Phantom (Frew Publishing) and Batman (K G Murray). The Phantom, despite being a fairly minor league US newspaper strip that had its finest moments in the 1930s, has become an Australian icon read by far more than comic fans. Produced as a comic book starting in the mid-1940s it edited together complete storylines from newspaper strips. Its appeal has had something to do with the Phantom’s taciturn demeanour and the strip’s all-round kitsch sensibility, accentuated by the repetitive nature of newspaper strips. It still continues to this day and is well past the thousand issue mark. The KG Murray Batman reprint was one of many DC reprints they published from the mid-1940s right through to the 1980s. These were, however, in editions that combined a variety of stories in one book. I was fascinated by the concept of superheroes, although initially I had trouble telling the two characters apart because they both wore masks! A far more significant event occurred towards the end of 1963 when I was seven. I still remember the circumstances fairly well. It was probably the start of the summer holidays, in early December, as I had accompanied my mother on an expedition to a number of shopping centres. At each I had looked into the newsagent seeking a new issue of a known series. However, there was nothing along these lines to be found. Instead, at every shop visited, I was presented with multiple copies of an issue of a superhero comic that I had never seen before. It looked a bit bizarre with a completely masked hero confronting an elderly looking villain dressed like a bird. In the end, determined to return with something to show for my efforts, I decided that if there were so many of them around I should see what all the fuss was about. The comic was Spiderman 7 and I became an instant convert to the dawning Marvel Age of Comics. I liked the wisecracking style of Stan Lee’s script, so much more appealing than the staid verbiage of the DC heroes. I also liked the editorial presence in the form of a letters page and announcements (the DC reprints had none of these), but I think the thing that I most appreciated was the sense of the wider Marvel universe, most clearly seen in the various advertisements for other titles contained in the issue. I was particularly intrigued by the cover of Avengers 2. When I found a copy of it a few weeks later my fate was sealed. Comics were then, as they still are to a lesser degree today, sold at newsagents and sub-newsagents aka milk bars. Newsagents, then as now, sold newspapers, magazines, stationary and greeting cards, although these days I fancy their biggest revenue raiser is lottery sales. In the highly regulated shop opening hours of this time milk bars were one of the few shops allowed to open after 5.30pm weekdays and 12.00 noon Saturdays. Apart from milk they sold confectionary, necessities and some sold newspapers and magazines. Comics were distributed by Gordon & Gotch, the book and magazine distributor which to this day carries the lion’s share of magazines nationwide. Whilst some of the bigger national mags, like Women’s Weekly and New Idea, use other distributors, Gotch handle nearly all imported magazines. In the mid-60s, comics, and presumably other American mags, went on sale on Friday (over the years this moved around between Thursday and Friday). Whilst there was a clearly defined release date in America, the vagaries of trans-Pacific shipping meant that anomalies would occur. The whole release date issue was further clouded by each title bearing a month on its cover which broadly corresponded to the date it came out in Australia. Of course, given that the comics were published in America some months before, this had no actual bearing to an Australian release date. I gather it had been part of an attempt by the US publishers, many years previously, to beguile newsvendors into keeping their titles on display for a few more months. My early days of collecting Marvels were thus far more miss than hit, which given the increasing prevalence of multi-part continuity made for some frustrating reading. Also reviews of DeeVee Flange and DeeVee 2001 “one of the best anthologies I’ve seen anywhere”. Nice work Phil, good to see a healthy paper/pixel relationship starting up. Latest 'Balloons' is a beauty, too! Because of people's increasingly short patience & attention spans (and the nature of 'printed' publishing), it can often be a 'long time between drinks' for readers - and so many authors/publications go 'off' people's radar rather quickly. So... it's great to see you blogging the mag (even in a preview sense) Philip. I think it'll be a good way to keep people informed about your mag, and for the scene 'itself' to grow through more of this type of constant activity. Is blogging the last refuge for crusty curmudgeons? Maybe so . . . Thanks guys. Let me just say that while there are clear advantages to blogging -- it's ease and especially accessability to people the world over -- I still consider that there is a place for the printed journal. As I have said in Issue 1's editorial it is more tangible and carries, I believe, a sense of greater authority. There's also the fact that it shows a greater sense of committment to stump up the money and go through the whole printing process. But that's just my opinion. i agree with you totally Philip. My take on blogs, is that i use it to keep myself (and my work) on people's radar. Since it's usually a while between publications, its a good way of letting fans know you're still producing. Start following our signals right now and gain up to 270% a day. Second Shore is a boutique Australian publisher specialising in works of and about the graphic story medium aka comics. It is run by Philip Bentley who has had a long history in the medium as reader, retailer (co-founder of Melbourne’s pop-culture emporium Minotaur), writer (of 2006’s multi Ledger Award-winning Passionate Nomads) and editor (of the current fanzine Word Balloons and two 1980s Australian comics: Inkspots and Fox Comics). Please note we do not accept unsolicted submissions. In Melbourne available from Minotaur, Elizabeth St and All Star, Lonsdale St and. or from the publisher for AU$5.00 post inclusive for issues 1-9, AU$7.00 for issues 10 & 11 &AU$10.00 for 12-14. Please pay via cheque or money order made out to Philip Bentley, direct transfer (contact for account details), or well hidden Australian notes, no responsibility taken for lost money. Those wishing to pay via notes may send $5.00 per issue 1-11. Send to the address below. All content on this blog, unless otherwise stated, is copyright © Philip Bentley. Material appearing on this blog may be freely cited elsewhere for purposes of criticism and review - so long as you provide a link back to this blog! All other material appearing on this blog (such as externally sourced artwork, article reprints etc) are copyright their respective copyright owners and are reproduced here under the "fair dealing for purpose of criticism or review" provisions of the Copyright Act 1968 (Australia).